How are the primaries of the transformers you see wired on the medium voltage side wired, line to line or line to neutral? Mike Whitt was telling me over on the home inspector board that they are always line to line. I never see them that way in SW Fla. They are wired from one MV phase to the grounded conductor. Is it just a Florida thing? I'm not an electrician, but I think most residential distribution systems today are wye, with a multi-grounded neutral common to the primary and secondary. The primaries are connected line-to-neutral. Most single-phase aerial distribution transformers have a single primary bushing, with the other end of the primary winding internally bonded to the transformer case and the secondary neutral. But I occasionally see a two-bushing transformer, where both ends of the primary are brought out to bushings. This type of transformer can be used on either delta systems (connected line-to-line) or wye systems (where one of the primary terminals is externally connected to the neutral). I think residential delta distribution was much more common in the past. Last edited by Albert; 04/07/08 09:40 PM. Thanks Albert, that was what I remembered when I was in the DC area but that was long ago. I looked at about 100 transformers today while I was driving around and I never saw one wired delta primary. The other strange thing on my street is they have 3 transformers wired in parallel on that 3 wire bus with the 120/240, serving 11 homes. It is only one short stretch, the rest are the regular "maypole" with a transformer serving 2, 3 or 4 houses straight from that pole. I suspect the bus was put in when there were only a couple scattered houses down the street (30-40 years ago) fed from one transformer and they just added transformers as the lots filled in. This is where the first few houses were built. Are you sure the transformers are really paralleled? Most often (around here at least), you'll see small strain insulators inserted in the two hot wires of the secondary bus to break it into independent sections, each fed by a single transformer. Or there may be two secondary insulator racks on a pole, but the transformer is only connected to one of them. A secondary section may physically span several poles, or it may only serve the houses connected to one "maypole", but in either case it's electrically separate (except for the neutral). Secondaries *can* be paralleled or "banked", but I think it's pretty rare in aerial distribution. I believe Detroit and someplace in southern California are some of the few places that do it. In contrast, urban areas with high load densities often do have such "network" systems, usually underground. These feature breaker-like devices called "network protectors" to isolate failed transformers from the interconnected system. 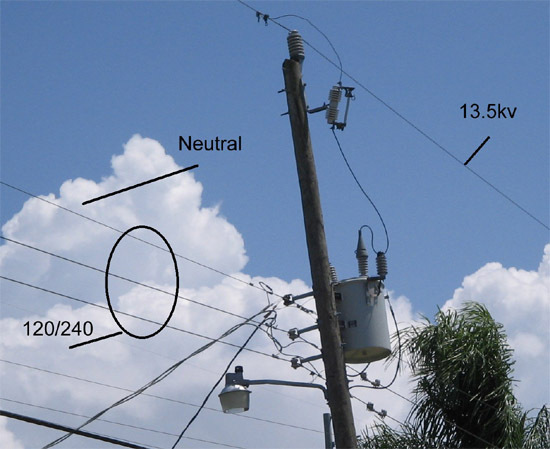 If you see three transformers of same size on the same pole, it's most likely for a three-phase service. Are there now, or was there previously, and commercial/industrial buildings on your street? I missed the point that the transformers are on the same pole. That being the case, I'm sure you're correct about the three-phase service. The transformers are spread down the 900' that this parallel bus is run a few hundred feet apart. You can see that it is one continuous run in that picture I posted. I have more pictures. The whole 3 street run, about 4000 feet comes from one primary leg with 18 transformers ranging from 25 to 50 KVA and feeds about 40 houses. The only place that has this bus scheme is the part near my house. I looked at the 1970 aerial photos and this is exactly where the only 5 houses on the street were. I bet it was all fed with one transformer in 1970. Those houses had old split bus panels, 60 or 100a then, at least one still does. Actually, looking again at your picture, I think I see insulators dividing the secondary into two sections. Look directly below the transformer at the two bottom (hot) wires - note the two bulges in each wire, sort of a "dog bone" shape. Those look to me like strain insulators, so the transformer would only feed the wires to the left of the pole. It varies from one POCO to another. Some like to use one high voltage line and neutral/ground, others use a pair of high voltage lines, 2 of the 3 phases. Also there is variation of how the secondary 120/240V lines are strung along poles. When they use 3 separate wires. Some places will have the neutral as the top of the 3 wires, other places will have the neutral as the middle wire. An arguement for the top wire being the neutral would be that it's the wire that would get touched by falling high voltage distribution wires. Thus shorting directly to ground and less high voltage getting into customers' homes. Albert, I will go out there and look at those "insulators" tomorrow. That would make sense if that is what they are doing. I thought it was strange. I still think this is a relic from when there were only 5 houses in 2 blocks but I agree they may have split it up. If I see my FPL neighbor I will ask him. This is also his "beat"
For sure the top strand of the 3 is the neutral. I have a picture where it starts and there is only the neutral. This whole cludge has fascinated me since I first noticed it and I just had an excuse to look closer at it. The original question referred to what current should be on the pole ground rod and how much gets reflected back on the drop to the house. More gee whiz info. The pole grounds are cruising at about a half an amp down at my end of the street until you get up near the feed 2000' away, one is 1.8 and the first pole with a transformer has almost 3a. With my service disconnect open I have about the same as the pole out front, on my service neutral at the service point, a bit less than half an amp so it is coming from the FPL side, not my house. The pole stayed the same with my SD on or off.